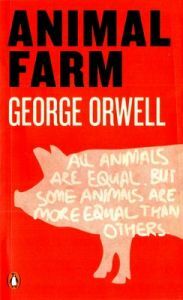 About The Book Animal Farm is an allegorical novel that depicts the rising rebellion among the animals on Mr Jones' farm, which are tired of serving human beings for all of their needs. Mr Jones owns Manor Farm. He once forgets to feed the animals on his farm. This results in rebellion under the headship of two pigs, namely Napoleon and Snowball. The animals intend to take over the entire farm from the humans. In an attempt to take over the farm, these animals rename it 'Animal Farm'. The ideals that they choose to embrace, involve focussing the benefits of all those who tread on four legs, which includes all the animals in the farm. However, as is the case with most rebellions, these ideals soon get corrupted with the passage of time. After a considerable amount of time, these ideals are forgotten in their entirety. Animal Farm thus portrays an exact account of a rebellion that went wrong. It also gives an accurate description of just how corrupting power can be. This satire is considered to be one of the best political satires of its time. Animal Farm has been published by Penguin India, in the year 2011 and is available in paperback. Key Features The book is held in high regard for being one of the finest political satires of its time. It depicts those events that led up to the Russian revolution, as well as what took place in the Stalin era. About the Author: The author of Animal Farm is George Orwell. His real name was Eric Arthur Blair. He was a very popular novelist, essayist, critic and journalist. His works spoke out against the social injustice that was prevalent at that time. He was in favour of democratic socialism and was opposed to totalitarianism. He continues to be held in high esteem as one of the most influential voices of his time, who spoke out about the English culture, as it was, during his lifespan.